Belle is an extra special mom, because she’s Lisa’s mother. She was born to Russian-Jewish parents in 1920 in Philadelphia (her dad died just before she was born). Raised with her six siblings during the depression, Belle began working as a waitress when she was sixteen, then married he rboss and became a restaurateur herself. She and her first husband, Roy, owned a number of different restaurants where Belle was the cook, waitress, hostess and manager (kind of like Lisa is today). When they divorced, she opened up her own luncheonette, called “The Little Spot” – with only 3 booths and 13 stools. She made everything from scratch every day, and waited on her guests, too. 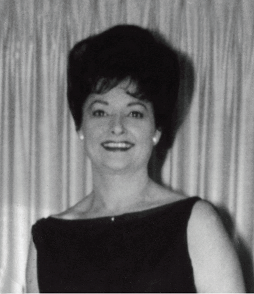 She was a trailblazer – a single mother of two running a successful business back in the 50’s. She met Lisa’s father in 1955, they married in 1956, she sold her restaurant, and Lisa was born a year later. Belle passed away when Lisa was only twenty-one, but the memories of her cooking live on. There’s no doubt that Lisa inherited her cooking abilities from her mom, who hosted numerous family dinners, fancy French buffets for 30 friends, and cooked every night for her family. Lisa still remembers the “kvells” (oohing and ahhing) of the family while they were sipping their matzoh ball soup or eating her amazing brisket, and only wishes she were alive today to taste hers. You should eat so good!